Last week we saw an image from the Snow White movie directed by Tarsem Singh and starring Lily Collins, which definitely looked like a sweet, princessy fairy tale. But the Kristen Stewart version — directed by Rupert Sanders and produced by Joe Roth, who's partly responsible for the 3D Alice in Wonderland — has a decidedly different look. 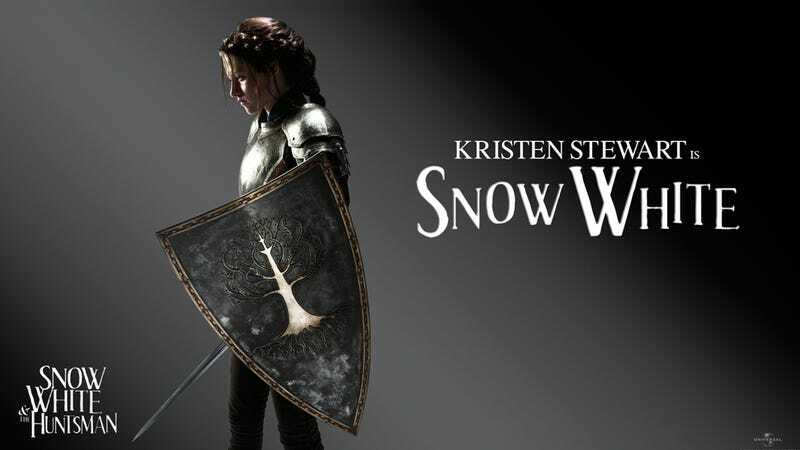 Instead of a ball gown and a sweet expression, Snow White wields a sword and shield. The plot still revolves around Snow White being the only person in the land fairer than the evil queen (Charlize Theron). But when the queen decides to destroy Snow White — sending a huntsman to dispose of her — the huntsman winds up training the young woman "in the art of war." Meanwhile, according to production notes, the prince "is enchanted by Snow White's beauty and power." So: Each film involves having the damsel in distress save herself. (Lily Collins said of her version of Snow White: "[it's] been modernized in a way that she becomes a fighter in the end.") But we'll have to wait and see whether or not there will be real girl power on display or just some pandering, Suckerpunch-style look-at-a-hot-girl-be-violent spectacle masquerading as empowerment. The queen accessorizes with feathers and jewelry. The dress almost looks like an Alexander McQueen knockoff. The Prince looks like a James Franco knockoff. The Hunstman is in need of a shampoo and deep conditioner.